Mr. Perfect fails a test for the first time. Episode 7 keeps the drama going. 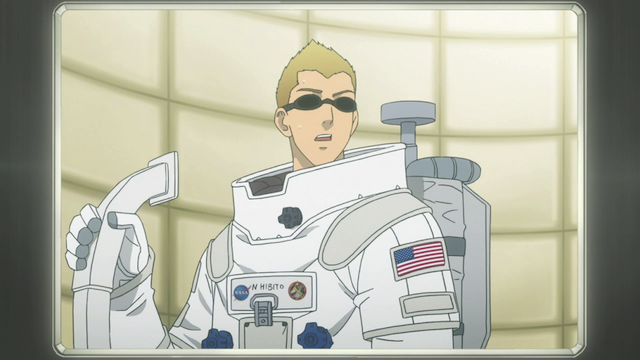 Back at JAXA, Mutta’s chance for getting into the space program seem particularly weak. 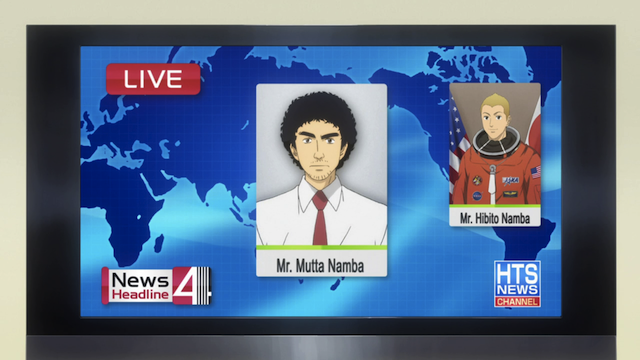 Hibito notices that Mutta seems upset about something, but Mutta can’t quite come clean about the whole situation. Finally Mutta gets caught up in an American crime spree. 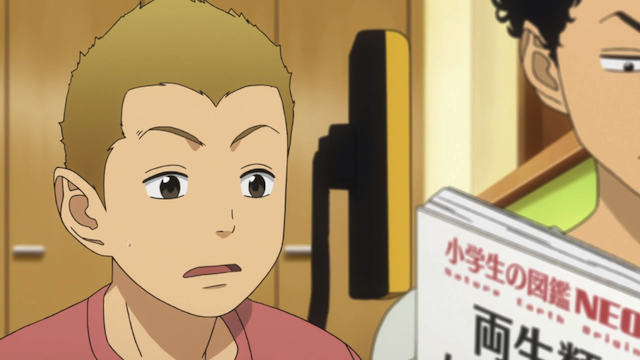 A young Hibito Nanba doesn’t understand how his older brother can concentrate with all the noise. For the first time, we get a taste of things from Hibito’s perspective. Previously Hibito’s perspective was provided when someone else related a memory of something Hibito had once told them. Here we get an actual recollection by Hibito, which indicates that he is worried about his brother. Hibito has long known of Mutta’s habit of overwhelming his senses when he is trying to get over something bad. As a result, he is aware that something is wrong, despite Mutta’s stoic refusal to share his concerns about how the JAXA selection is proceeding. Damned newscasters who can’t even pronounce the names of all of the states. By the way, I have seen some speculation that Hibito failed the blindfold test because he was worrying about his brother. I honestly don’t think that is it. I think Hibito isn’t particularly strong on detail-oriented work (that is Mutta’s strength). Hibito is a bit of a jock, and there is a big difference between lifting weights and memorizing all the locations in the airlock. This issue was emphasized again during this episode, as Mutta had an obsessive need to remove the label from the pot that Hibito had left for who knows how long. Cliffhanger: Mutta is caught up in a robbery. I’m looking forward to seeing exactly how they work this out, but it is pretty clear that Mutta needs a win right about now. Further, he demonstrated his knowledge of his surroundings without having the ability to see right before the fire extinguisher attack began. I fully expect Mutta to not only pull through, but come out the hero. You can do it, big brother! I liked the change-of-pace this episode had, especially entering Hibito’s head and seeing what he sees and hearing what he thinks. It turned out to be a great move since this change of perspective gave us a fresh look at the characters and the series and pointed out some topics that were reinvented for us and made noticeable or more important. I hope they continue to show the series through the eyes of other characters since that is a method of storytelling that I always enjoy. As for the fire-extinguisher attack, I’m sure Mutta will be the hero but through a comical way or some mishap that places him on top. He knows the entire restaurant and will be able to do something about it but I think the whole “luck” issue will come into play before the situation is resolved. 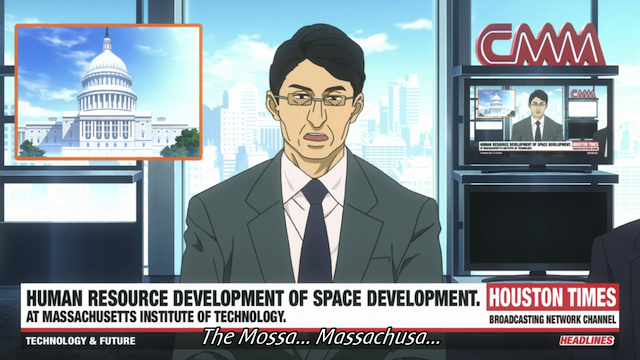 And I don’t think we even need to mention that this will be what propels him to the next stage in JAXA since he’ll be heading back to Japan now that he’s exhausted virtually everything to do in America. I’m looking forward to seeing how they handle the restaurant scene. Up until now the tension has really been psychological. There was always a bit of a disconnect between the activities we watched and the real conflict at the heart of the story. For example, when Mutta was going through all of the physical exams, the tension wasn’t tied to how he did on any particular exam. Here the situation is a bit different; how he performs in this situation will have a big impact on the central issues of the story — his self-esteem, his relationship with his brother, and how the folks at JAXA perceive him.